Will Elon's all-nighters at the Tesla factory bring production up to speed? Elon Musk is under a lot of pressure right now – Model 3 production over at the Tesla factory isn’t exactly going according to plan. First, Q1 numbers looked grim: less than 10,000 Model 3s rolled off the assembly line — a far shot from his promise of producing 5,000 Model 3s a week. And then there’s the other distraction: Tesla’s big fight with the feds over releasing data it has on a fatal Model X crash back in March. Elon has a lot of damage control ahead of him, and of course, a growing number of impatient customers and investors. So where’s the fire, Elon? Is Tesla’s Gigafactory not up to the task? In a head-turning interview with CBS Good Morning, he claimed: it’s the dang robots. Tesla has increasingly relied on streamlining its assembly process, and has ended up with one of the most robotics-reliant car production lines in the world. 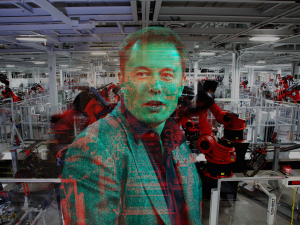 As more robots rolled out on to the factory floor, fewer humans were involved — and they’re hurting, spurned on by Musk’s ambitious goals. The plan: a robotic car-building factory operating at superhuman speeds. But the numbers seem to suggest that Tesla isn’t even close. Who knew that building a $35,000 EV was complicated? Tesla’s growing pains are more apparent than ever. Musk admits he even sleeps inside a conference room, wearing his little Tesla-logo-adorned baseball cap, at the company’s Fremont factory. “It’s terrible, it’s not even a comfortable couch,” he admits to the CBS reporter. It’s an odd attempt to send a message to the world (and shareholders): See, he cares after all! He’s just like us! Humans are truly underrated, Elon. But they have their limits, too.